It’s been almost year since Amy Chang took the reins as the head honcho of Cisco’s Collaboration Technology Group. 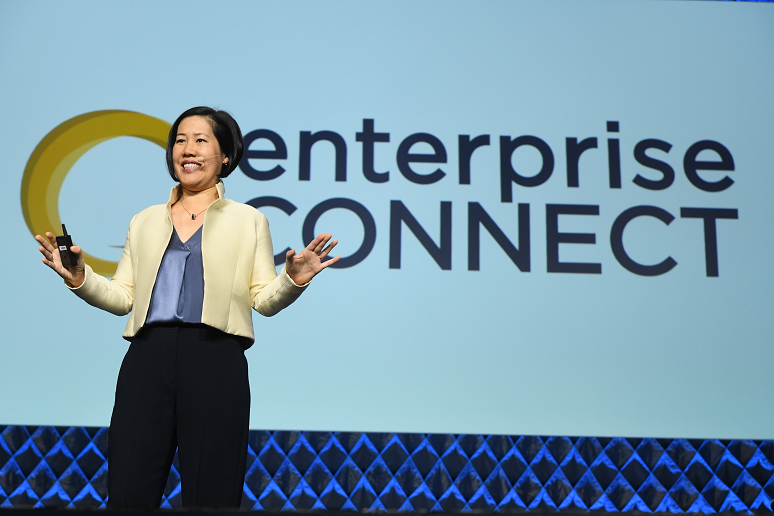 Many of us analysts had the opportunity to meet the high-energy leader at an analyst event the company held in February, but for most of the Enterprise Connect audience, this was the first time they saw Chang speak publicly. Cisco has been an important part of the collaboration industry and Enterprise Connect for years. In introducing Amy, conference GM and co-chair Eric Krapf mentioned how Cisco has been the vendor that has set the direction for the communications industry multiple times, so expectations were high. Chang’s keynote revolved around what Cisco is calling “cognitive collaboration,” which is the infusion of data and intelligence into unified communications (UC) and contact center (CC) technology solutions. The concept of contextual communications has been around for some time and demonstrated often. An example would be using the speech interface to call an individual, uttering a command like “call Amy Chang.” The issue with this is that there might be many people with that name in the directory. During her keynote, Chang jokingly said that her name is like the “John Smith” of China, to underscore the difficulty systems may have in identifying the right Amy Chang. But with cognitive collaboration, the system would understand who you are, the network of people associated with you, and then predict who’s the right Amy Chang. In fact, if done correctly, the voice agent can just be told “Call Amy” to achieve the same results. Cognitive capabilities are important in making meetings better and more efficient. Many vendors focus on technical things like 4K video and HD voice. These are certainly necessary components of a great meeting, but more is needed. Contextual collaboration can push the right information to everyone in the meeting, simultaneously changing meeting dynamics. This means if I’m in a meeting with five other people, each of us will see something slightly different based on our job title, network of people, knowledge base, or skill level. 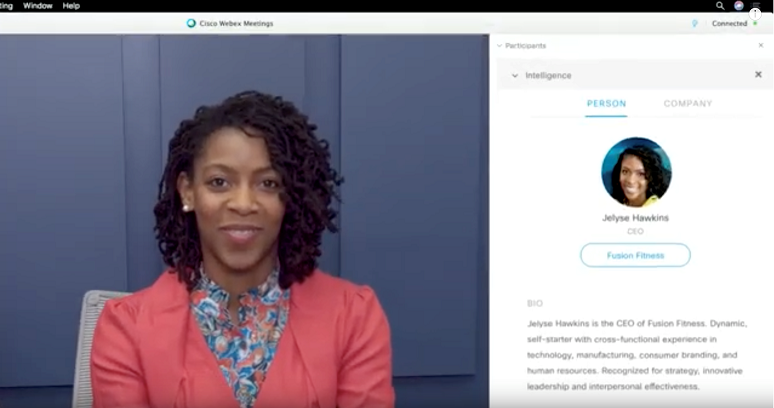 People Insights uses data from Accompany, the company Chang founded and Cisco acquired in May, to provide professional profile information about the people in meetings. The feature uses artificial intelligence (AI) to display real-time contextual information of people and companies. Accompany isn’t static data, like an employee profile might be, nor does it depend on a person to keep it current, liked LinkedIn does. Rather, it’s constantly scouring the Internet for up-to-date publicly available information -- creating a “living, breathing profile of the people and companies you care about,” Cisco said. The below graphic shows that, from within a Webex meeting, a user could look up a person, read their bio, and find other relevant information. This can help significantly reduce the amount of time required to prep for a meeting. People Insights is currently available as a trial, with general availability slated for June. Webex Assistant has been updated to include a new feature called Proactive Join, which provides the ability to enter a meeting simply by walking into a meeting space. Upon entering the meeting room, the assistant will automatically ask if the user wants to join and then starts the meeting. This functionality is enabled by marrying Cisco’s intelligent proximity technology with calendar integration. There’s also another new feature called First Match that solves the problem I described above where one might want to contact someone with a common name but there’s multiple contacts with that name. The Webex Assistant will look through interaction history in Webex Teams to deduce the most likely match. Earlier field trials of the First Match feature displayed a “top three,” but the digital assistant was right so often that customers asked Cisco to only display the first match. Proactive Join and Webex Assistant are generally available (GA) now across all Webex Room Series products. Proactive Join will be GA in June, just in time for Cisco Live. Facial recognition is kind of an augmented reality application for video where a person’s name and title are superimposed on the screen in front of the people, acting as name badges. This has always been the stuff of science fiction, made popular in Back to the Future II when Marty McFly was talking to Doug Needles on a video call. The movie version of this feature showed not only name and title but also hobbies, address, etc. It will be interesting to see where Cisco takes this feature next. As an example, if a salesperson is talking to a customer, it could show what products were purchased and the age of them, helping drive a refresh conversation. If a customer support person were involved in the discussion, they would see the last trouble ticket and the status of it. Now that the mechanism has been built, there’s almost limitless potential, as these kinds of features make video better than in-person meetings. This feature will be made available in June as well. An interesting challenge for Cisco is how to broaden the base of people in its database. Chang mentioned Accompany has information on about 250 million people, which is significant, but there are 7.6 billion people on the planet and most of them have a significant online presence. Cognitive collaboration can be game changing for meetings between professionals for B2B purposes, but not so much for B2C. As an example, if a recruiter tried to contact a college student, there might not be any public information to help educate the person prior to the call. At this point in time, what Cisco showed is impressive and a great starting point. Also during her keynote, Chang gave a brief update on its premises-based product Jabber, assuring everyone that Cisco has no plans for ditching the product any time soon. There has been so much public focus on Webex, Webex Teams, and the cloud that Jabber customers have been questioning Cisco’s commitment to the on-premises product. Chang threw out an interesting stat that in the 10 months that she has been at Cisco, Jabber has grown from 36 million active users to 45 million. Compare this to Slack, which has a total of about 10 million active users. Despite the doom and gloom of the cloud eating all on-premises products, Jabber has grown almost an entire Slack during the 10 months Chang has been leading Cisco. Cisco is committed to being cloud first, but not cloud only, and now it’s wearing that as a badge of honor. The AI era has arrived in collaboration, and it promises to change the way we work in ways we could never have imagined. Cisco gave us a taste of what’s possible, but the journey is just beginning, making Enterprise Connect 2020 a must-attend event. Artificial intelligence is happening -- and it's pervasive at Enterprise Connect 2019.